Each year, Tanzania’s Serengeti National Park and Kenya’s Maasai Mara bear witness to the Wildebeest Migration in East Africa, one of the greatest wildlife spectacles on the planet. Arrive today and ﬂy into the Northwestern Serengeti. Upon arrival, you’ll settle into your seasonal accommodation, a stylish traditional East African camp. 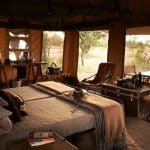 Set in the southern Maswa Game Reserve, it serves as a base from which you have exclusive access to hundreds of thousands of acres of acacia clad woodland. The lavish Meru style tents are decorated in classic Safari style with large beds and opulent rugs inside. Swathes of cotton soften the luxuriant bedroom furniture, while plush velvet curtains lead to plumbed bathrooms, and wild flower-filled vases conjure up idyllic Africa. Settle in for a quiet evening and a wholesome meal in the distant company of roaring lions. Following breakfast this morning, you will head out on your first game drive. 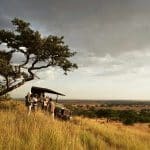 With an open-topped four-wheel drive safari vehicle reserved daily for you, and experienced drivers and staff ready to help you plan each day, you will find yourself immersed in the rhythm of the African plains. The secluded northern Serengeti is full of secret valleys and ranging hills, with the Mara river running through it. The Maasai Mara National Reserve in Kenya lies just across the border. Kogatende, also known as Wogakuria, is home to abundant wildlife, including lion, hyena, cheetah, zebra, and buffalo. Birds, too, are proliﬁc. Including migrants, well over 450 species have been recorded here, and among them are 57 species of birds of prey. Stop for a picnic lunch, then continue on for as long as you wish today. You may choose to stay out for much of the afternoon. The climate here is gentle, and is rarely too hot. Rain, when it falls, almost always comes during the late afternoon or night. Return to camp, dining in the open air, accompanied by the sounds of the wildlife in whose company you have spent the day. After a hearty bush breakfast, another game drive awaits you today. Between June and November the migration passes through, making this the region’s most exciting time! Zebra lead great trains of wildebeest splashing across the Mara River, dashing past the prehistoric crocodile, while indulgent lion, cheetah, and leopard pursue and delight in the smorgasbord of nomadic mega herds. A picnic lunch will be prepared for you today as well, after which, you can return to camp, or continue your exploration. Drive through the hidden valley of the Wogakuria, through swaying seas of grass that are open to the lake basin skies, and framed, in the north, by a range of distinctive inselbergs. Return for another evening of farmhouse fresh cuisine served in the open air. Today you will head out on a full day walking safari. Walk with experienced Maasai guides into this quintessentially Africa landscape. You will immediately notice the difference between a vehicle experience and one had on foot. Each of your senses will strain to take in all the signs of the wild game that surround you. Your perception of the bush will change until you feel an intimate relationship with the environment through which you trek. This evening, you’ll sleep outside in open, luxury fly-camping beneath African skies. Return to camp this morning, taking your time as you continue your walking safari. Follow the flight of a vulture and watch as it lands in a treetop. Conceivably it has found the pride of lion whose calls you heard last night in the distance. Enjoy a peaceful afternoon, relaxing in base camp. You have the option of enjoying another game drive before dinner; there is always more to see. This morning you may wish to see the Serengeti from another angle. You have the option of reserving a hot air balloon ride (not included). Following an early morning departure from camp, you will transfer to the take-off point for the start of your flight. 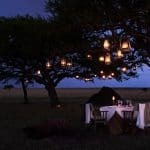 Suspended in a basket beneath the balloon’s canopy, float over the plains and forest canopy along the Mara River, looking down upon hippos, crocs, and elephants from high above. The flight time is generally one hour, and ends with a champagne breakfast in the open grassland within the reserve. On your final morning, enjoy breakfast at camp, followed by a return to Kogatende airstrip for your departure flight.